Experience a different kind of vacation, one that is away from the crowds of the beach. Flip Flop Repair Shop is located on the north side of historic Perdido Bay in the quiet community of Perdido Beach, Alabama. 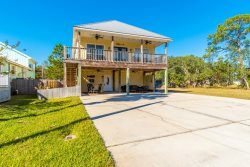 Nestled on the northern banks of Perdido Bay, this unique vacation getaway offers the best of both, a serene setting as well as the convenience of the beaches and entertainment just minutes away. Kayaks are available for your enjoyment on Perdido Bay, Palmetto Creek, and Soldiers Creek. Kayakers often have close up dolphin encounters. Flip Flop Repair Shop also has a private pool and is heated during winter months. (Heated with solar panels. Temperatures depend on weather conditions) This 4 bedroom 2 bath beach house will comfortably sleep up to 10 guests as it includes a queen blow up mattress. The spacious living room and each bedroom is equipped with a flat screen TV so you can enjoy having cozy movie nights in. Both the open concept living area and master bedroom have direct views of the bay. The large kitchen is fully stocked with seating for 2 at the bar and an additional 4 at the dining table. There's an additional tall table in the living room with seating for 4. The house also includes a full sized washer & dryer for your convenience. There is a covered patio balcony where you can sit and watch the sunrise while enjoying your morning coffee or relax as you watch the gorgeous warm sunsets in the evening! Downstairs you will find a hammock, shower (for rinsing sand off), kayaks, and a bbq grill. Buddy is the golden retriever in the picture and was my companion for 14 years. As far as he was concerned he was the overseer of Perdido Bay. He would sit in the bay for hours watching for fish to jump. He never caught one! I like to believe his spirit is still watching over our home and the bay. Free Activities Included! To enhance your vacation experience, Flip Flop Vacations includes Xplorie, which means free admissions and rentals every day of your stay at select popular attractions in the area. Please Click Here to see the free fun included with this Flip Flop Vacations rental! very friendly, easy to work with. My family & I absolutely adored 'bama. We brought our 8 year old boxer with us, he loved it. soon after Elvis (the boxer) went down hill, he passed mid December. We always say we are so glad Elvis got to enjoy an amazing last vacation, before he passed. EVERYTHING was perfect and EXACTLY like the pictures, we couldn't have been more impressed. The neighbors were incredibly friendly too. The pool was shallow for little kids, but then really deep for adults/teens (it was awesome). The outdoor shower was awesome for just coming back from the beach & washing our dog off. We wanted to come back this summer, but it is all booked so we will be back in 2020!! Couldn't be happier with our experience. The property was very spacious and had more amenities than expected. It met all of our needs. We enjoyed the relaxation and plan to return! Thank you for sharing your property. We absolutely loved spending a long weekend at Flip Flop Repair Shop. The views from the house are amazing and we loved having a fenced in yard for our dogs. We loved it so much we booked a reservation for next summer before we even left. We will definitely be back. Keith was easy to get ahold of and communicate any needs with. He was friendly and very helpful. The house had the most gorgeous view of the bay and the private pool was an added bonus. I wish there would have been easier access to the bay from the actual property, but the access available was sufficient. The location was very secluded and private and perfect for those wanting to get away and escape for a week. And the fact that it was pet friendly made it even better as we got to bring our dogs along to enjoy vacation as wel. The property was wonderful and we can't wait to stay again - absolutely gorgeous setting! Our 8-year-old boxer enjoyed it as much as we did! Kitchen is extremely well appointed and cleanliness overall was outstanding. Thank you for a great experience. Keith is friendly and makes your stay fun. We have stayed here 5 times and will definitely be back again. The pool is great, the view is gorgeous!We enjoyed getting fresh seafood and cooking it in the kitchen. Flip Flop Repair Shop was the perfect vacation spot for our family. It had everything we needed for a fabulous vacay. We are already planning our next trip out. This house is our new home away from home. It has everything you need to play and relax. The view from the huge, comfy deck makes for a nice night cap in the evenings and coffee in the mornings. A great place to relax and unwind. This house was beautiful. Great views and lots of fun activities at the house. Awesome fenced in backyard for the pups. Overall great stay!! Quick to respond to any question no matter how small. Very friendly and helpful. This was our second year at this property. Everything was easy because we had done it before. We loved the sunrises on the bay. The pool was great. We will be back next year! We had a little glitch at check in, because we arrived about 20 minutes early and the lock was set for 3 pm. Keith came right over and let us in a little early. He was very helpful and gave us directions to places in the area. We thoroughly enjoyed our stay at Fip Flop. It was very peaceful and relaxing. It is secluded, but it was just a short drive to Gulf Shores. The house was great and it was so nice to be able to take our 10 year old lab on this trip. There aren't many nice rentals that will allow you to bring a large dog. We are very appreciative that the owners understand how special it is, to be able to travel with your 4 legged friends! We will definitely be back!! The entire process was kept very simple and easy. We had a wonderful time at "Flip Flop Repair Shop". Both kids and adults enjoyed crab hunting and kayaking the most. The dogs enjoyed the fully fenced in yard. We honestly felt like we got the best of both worlds staying here....seclusion with private beach and pool.....but just a quick 20 minute drive to public beaches, restaurants, and entertainment. Love this place...our 2nd trip Oct 1st thru 8th...will definitely be back again! Keith, is just awesome. He wants to make sure everything is perfect for you. Love the property and look forward to many more visits. Almost don't want to comment because it's our little secret! Great owner, great amenities and very relaxing. The surroundings were very quiet and serene. Having our own pool gave us the pleasure of swimming when we wanted. The back porch offered a beautiful view of the bay and outlying cities. Beautiful , perfect beach trip without any of the crowds! Rental rates do not include cleaning fees, sales and lodging taxes, and a non-refundable $34 processing fee. Please use the 'Book it Now' button to review a detailed breakdown of charges and total cost. 30% deposit is required to reserve the property. Payment is due in full within 30 days of arrival date. Cancelations: Any cancelations prior to 30 days from the arrival date will receive a full refund, minus the $34 processing fee.